Magic Wand by downeym #3DThursday #3DPrinting #3D « Adafruit Industries – Makers, hackers, artists, designers and engineers! I wanted a reason to play with the NeoPixel strips you guys sell, so I made a nifty “Magic Wand” and thought I would share the source files. 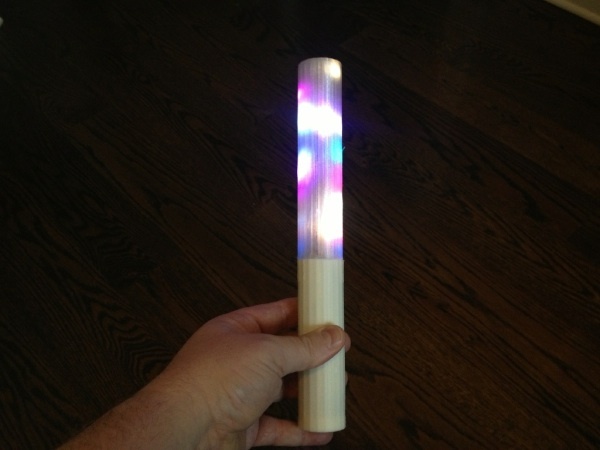 This is a light wand that uses a 60 LED strip and a small embedded microcontroller to control the LEDs. I have included the Arduino source code with the thing files. You can programmatically make any light sequence you want by altering the source code. This uses 3 AA batteries to power the LED strip and the microcontroller. The battery compartment is printed inside the handle of the wand. The battery door is held in place by a single M3x20 screw. information on how to install Arduino for the Trinket microcontroller can be found here. Information on how the LED strip works can be found here. Trinket Microcontroller can be purchased here. LED strip can be purchased here.